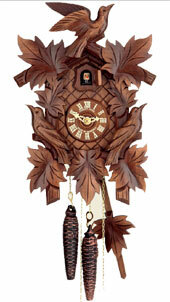 Traditional 5 leaf design 14 inch cuckoo clock by Hubert Herr. 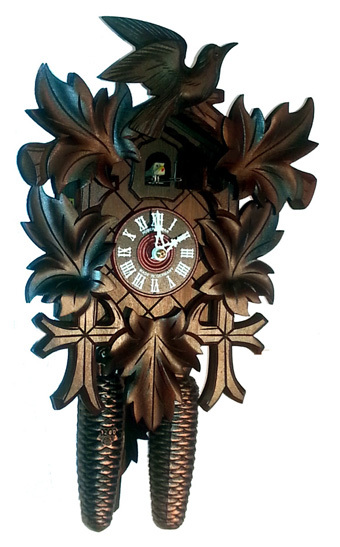 Great starter clock with the convenience of a 8 day movement (wind only once a week) for the price of a 1 day clock . If the cuckoo sound keeps you up at night, use the night shut off to silence the clock. Cuckoo calls the full hour and cuckoos once at the half hour. Clock case is solid wood and is stained not painted. Clock features also crossed front and wooden dial.